Medrar is a cultural corporate and philanthropic platform for young emerging artists based in Egypt. It aims to contribute to the motivation of different means of communication, developing experiences and financial support for contemporary praxis on the local, regional and international level. Medrar’s main objective is to drive the interest of young emerging artists and provide them with chances of experimentation and accession, by encouraging their activities and the intercultural exchange between them globally. We enhance the creation of space for dialogue between young art critics by producing serial prospectuses critique researches and providing database for curatorial based projects. 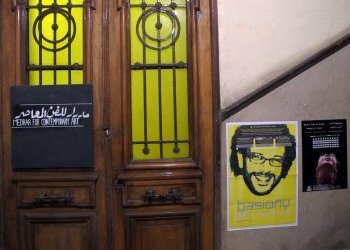 Having curated and organized several events, Medrar initiated the annual international Cairo Video festival and the Open Lab Egypt project for Interactive Media Art. Artistic workshop has been done by and at Medrar in September 2012 in Cairo. Bearing Witness: or “the stories of ordinary people living during extraordinary times” is a contemporary art theory and practice project that is based on the methodology of Plexus International’s co-operas.